The Asian markets have opened and the US Dollar Index is retreating, allowing several currency pairs to rise. There could be some volatility for traders as this week goes on, different countries will be addressing their economic concerns and perhaps trying to position their currencies so as to spur employment. Here is a chart of the US Dollar Index and you can see the reversal pattern and today's bar indicating a drop. 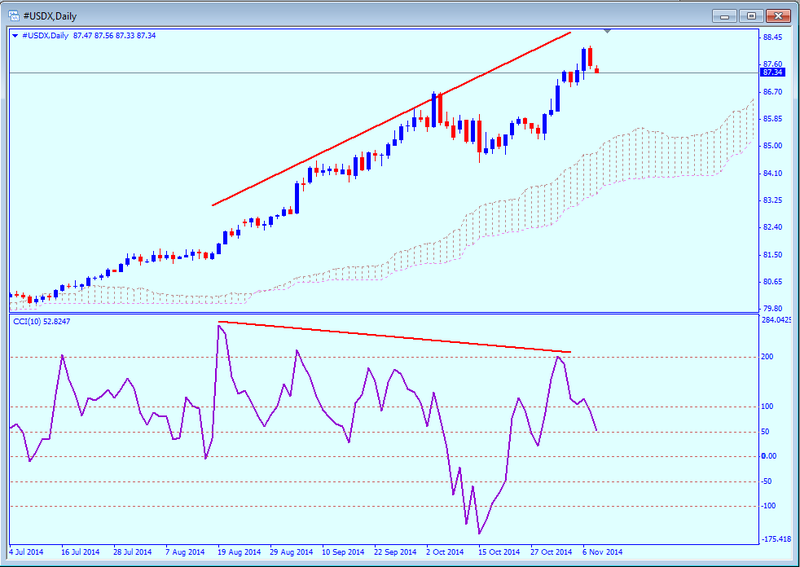 Also notice the divergence between the price and the indicator, there may be a significant price adjustment coming. Or... the rise may continue unabated, Divergences are not always indicative as to what is happening. We will get more of an idea as to what may becoming in the currency markets this week once the European markets open for trading in a few hours. In the mean time I have a couple articles that you may find interesting. It may be that China will want to upset the US and the current currency arrangements. The articles are showing that several currencies are rising as the US Dollar eases off. It is difficult to say if this move is temporary or long term, the recent move by the Bank of Japan to increase asset purchases was quite a surprise to many governments, the effects are still unknown. We will know a lot more as days pass. Have a great week ahead.! !